Wild date palm | Infonet Biovision Home. Found throughout tropical Africa. In high rainfall areas it grows on open rocky hillsides and cliffs, as well as in rain forests, but only along river-courses in dry country. Widely distributed in Kenya; cultivated in towns as ornamental. Often growing in dense clumps along watercourses and at forest edges. 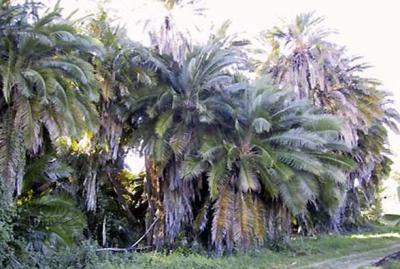 P. reclinata is a clump-forming palm; it may be solitary but is usually found growing in colonies. It grows throughout tropical Africa in humid lowland woodlands, highland forests and on open, rocky hillsides. It occasionally grows in grasslands with a high water table. The leaf stems (rachis) are used to make traditional beds (Somali). 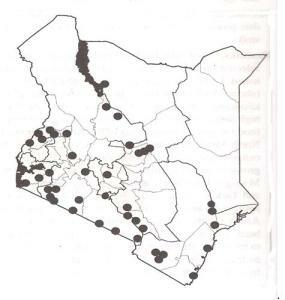 It is over-exploited in northern and north-eastern Kenya for its use in handicrafts. Altitude ranges between 0 and 2,600 m and occasionally higher. Mean annual rainfall is between 500 - 1 500 mm and is found in agro-ecological zones II - VII (only riverine in driest areas). Seedlings and suckers are used for propagation. You may remove leaf stalks and root suckers for ornamentals. They may be established in mixed systems, amenity gardens, and along watercourses. Food: Buds may be eaten raw or cooked as a vegetable. The heart of the crown is eaten, and the fruit is also edible. Fodder: Leaves are eaten by elephants, and the fruit is food for many wild animals. Fuel: Wood is suitable for production of charcoal. Fibre: Mats, rope, baskets and string can be made from the fibres of young, unexpanded leaves in immature palms, while the midribs of mature leaves are used to make baskets and roofing material. Fibres from the stem are made into brushes and brooms, and in the Cape region of South Africa, leaves are used in making the kilts of Xhosa boys taking part in initiation ceremonies. Timber: The wood, which is resistant to white ants and fungi, is used for hut building, making doors, windows and fence posts. Gum or resin: Roots of P. reclinata yield a gum. Tannin or dyestuff: Leaves yield a useful dye, and roots contain tannin. Alcohol: A palm wine can be brewed from the fermented sap obtained from trees. Medicine: Parts of the tree are used as a remedy for pleurisy. It can be used in soil conservation by controlling soil erosion. It is also used for ornamental purposes. The tree may be destroyed by the larvae of the butterfly, Zophopetes dysmephilai, which feed on the leaves.